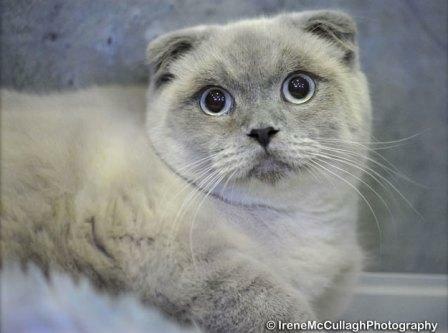 Scottish Fold cats are rare domestic cat breeds with folded ears. This is the characteristic feature of the breed. The cat's folded ears are caused by a spontaneous mutation of a simple dominant gene. This means that if one parent cat carries the gene for folded ears and the other parent cat the gene for straight ears, the kittens will have folded ears. and as a result, suspended registration in 1971. Experts believe that these skeletal deformities, with specific reference to inflexible and shortened tails was due to inbreeding and not due to the Fd gene that results in folded ears. The ears should be small, tightly folded and bend forward and downward. The tips of the ears should be rounded and set in a cap like fashion, thereby accentuating the rounded head and forehead. Sometimes the ears may be large and loosely-folded, but this is less desirable. Kitten's ears only start folding at around the 3rd week after birth and the degree of the fold can only be seen after 6 weeks. 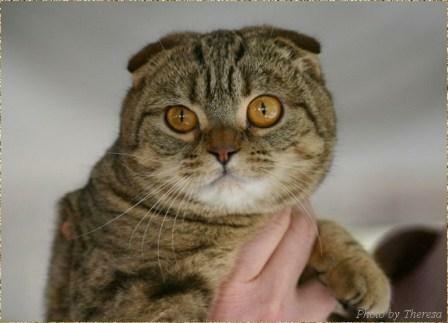 The Scottish Fold cat has a medium sized, muscular and rounded body which is firm and well padded. Even though they are stocky cats, they should exhibit good mobility and flexibility and should not be obese. The cat's neck is muscular and relatively short and their legs should be well boned, flexible and be in proportion to their bodies. The Fold's tail should be medium long, thick at the base at taper to a rounded tip. Their head is rounded with a domed forehead, prominent cheeks and their nose is short and broad. 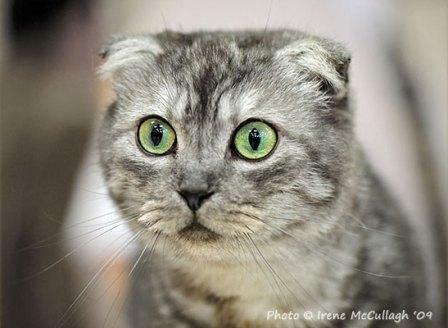 The eyes are large, round, wide-open and are well-spaced giving the cat a sweet expression. Eye-color and coat color should correspond and the color ranges from hazel, green, deep blue, copper or even odd-eye (i.e. 1 blue and 1 gold eye). The shorthaired coat is medium-short and stands away from the body and the hair is plush, soft and dense and the texture of the coat may vary dependent on climate and the coat color. The longhaired cat, also known as the Highland Fold, has a tail plume, tufts of hair on the toes, britches and ear furnishings. Generally they have a full coat on the body and face, but shorter hair on and around the face is allowed. 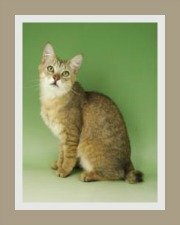 Most coat colors and patterns are accepted - solid colors, tabby, calico, bi-color, shaded and smoke and pointed coats. 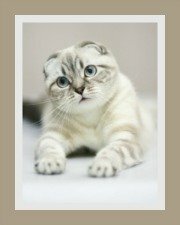 Scottish Fold cats will do well indoors or outdoors - there are advantages and disadvantages to both. Outdoor cats that are permitted to roam will be exposed to all sorts of dangers like unfriendly dogs, cats and humans. They are also at risk of been run over and contracting feline diseases. If possible, provide your cat with an escape-proof outdoor enclosure or cat run with direct access to your home - this offers your kitty the best of both worlds. 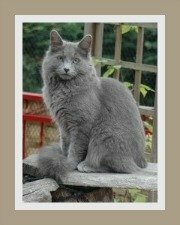 It is a friendly, peaceful and a non-dominant cat that will do well in any family including a home with dogs and other cats. 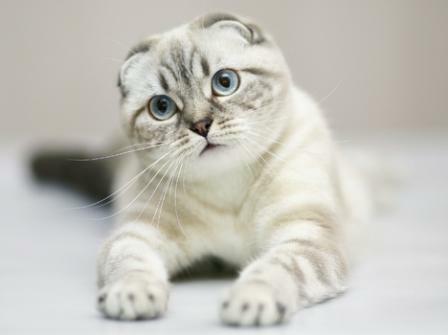 The Scottish Fold will adjust to a single and multi-family household. These cats have wonderful dispositions. They adore their humans, but are not considered lap cats. They are playful and known for their excellent hunting skills. Folds are best described as a quiet-voiced, discreet, loving, gentle and playful cats. The shorthaired Scottish Fold requires minimal grooming whilst the longhaired variety requires brushing twice a week. 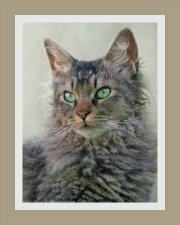 Visit the chapter on cat hair care for tips on grooming longhaired cats. Special attention should be paid to their ears. This is relatively easy - gently lift the tip of ear in an upward direction and wipe the visible area of the ear with a damp clean cloth. Do not be tempted to use a Q-tip or ear bud in the ear. 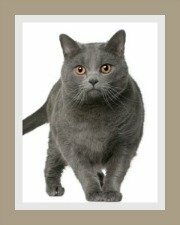 This is a healthy, robust cat breed but certain breeding lines may have genetic abnormalities. Genetic health issues can be avoided if proper breeding protocols are adhered to. 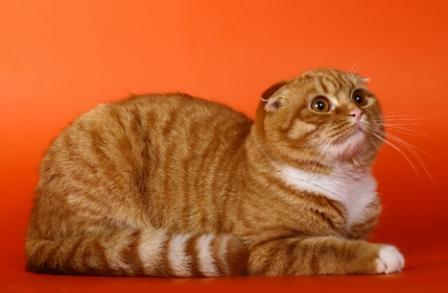 Scottish Fold cats should be bred with 'pricked-eared' (straight-eared) cats and are generally out-crossed to British and American Shorthairs to prevent genetic abnormalities. Two-folded eared cats should never be mated. Inbreeding may result in bone and cartilage deformities like osteochondrodysplasia. Polycystic kidney disease (PKD) is a common kidney disease found in the Persian and American Shorthair and due to outcrossing is also found in the Fold. Hypertrophic cardiomyopathy is a common heart disease in cats which causes a thickening of the heart muscle. 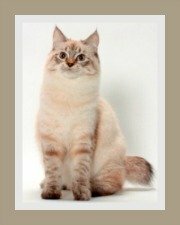 It is recommended that you purchase your cat from a reputable cat breeder with a history of breeding healthy cats and who can provide proof of screening for the above diseases. They are susceptible to ear mites and this is easily rectified if good ear hygiene is maintained. Weekly ear examination and cleaning is essential. Your cat will need to be vaccinated against all the common infectious feline diseases. Veterinary fees are expensive, so you should always consider medical cat insurance for your pet. 'Folds' as they are affectionately called are prone to obesity and a good low calorie diet is recommended. Water and not milk is also an essential part of their diet. Weight differs between male and female cats, but on average they should weigh between 2.6 - 6.0 kg (5.7 - 13.2 lbs). The average life span for these cats is 12 years.